On October 14th. and 15th., 2017, Doshu Moriteru Ueshiba, has dictated a Seminar in the city of Buenos Aires, Argentina. 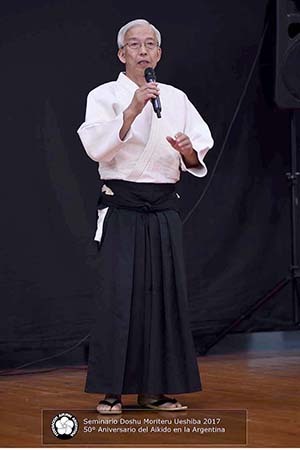 It was performed in the “Centro Galicia de Buenos Aires” , where a special space were conditioned for over 800 enthusiast practitioners of aikido, some of them arrived from other countries. Here, this highest authority of aikido world-wide, showed his impeccable skill inherit from very the root of this art, allowing us to enjoy two days of intense learning experience. Shimbukan Argentina was present at this important event, represented by its Director, Ricardo López Sensei, and pupils from its integrating dojos.